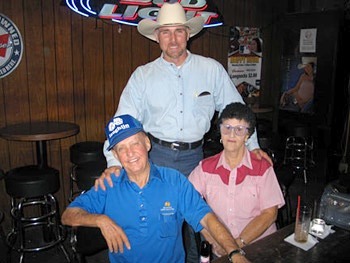 "The Beloved Ambassador of The Bakersfield Sound"
Sept. 8, 2011 - Lew Dobbins, recently recorded a radio show called "The Hank Williams, True Radio Story". 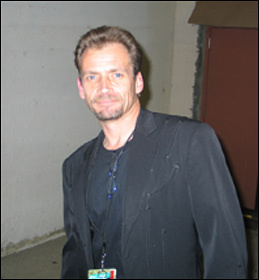 Lew Dobbins is an award winning radio personality, well known throughout the US by major music industry members. 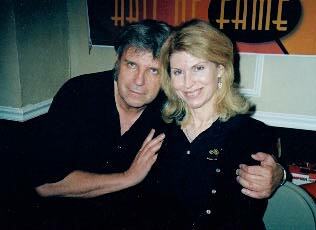 Lew has been inducted into the West Virginia Hall of Fame, nominated for National Radio Personality of the year, and also reported to Billboard Magazine throughout the 70's, 80's, and 90's. He is currently working on 96.3 FM WOTR in West Virginia, and also works with other networks. We just listened to it for the first time and really loved the whole show. He interviewed Jett, Hank Jr and Hank III, and included many celebrities like Jimmy Dickens, Minnie Pearl, Merle Kilgore, Billy Walker, and David Church, (the #1 Hank Williams Tribute artist), including others. The 75 minute show will soon be available for syndication for a possible new years show. (the date of Hank Williams death). This bar was bought by Pete Castro, a life long Bakersfield resident who worked in the Beer industry here in Kern County for 42 years. This was the original bar in the Blackboard Bar. It has been re-upholstered to its original form. Glenn J. "The Ambassador of the Bakersfield Sound" Pogatchnik was recently acknowledged as a contributor on the latest boxed sets of Merle and Bonnie manufactured by the Bear Family Records of Hamburg, Germany. 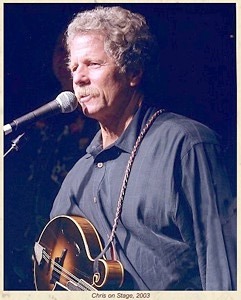 Glenn had arranged interviews between Deke Dickerson who wrote the liner notes and Merle. Glenn's name appears on the boxed set covers, each cd and the detailed booklets that accompany the boxed sets. When asked how he felt about the surprise Glenn said "I wonder when I'm going to get my royalty payments." Just kidding folks. We wanted to note the passing of our friend Chester Smith who passed away August 8, 2008. Chester was a mentor to me because like his friend Buck Owens he had the good sense to get out of the music business and go into the business world and like Buck he made a ton of money. Chester had some national hits earlier in his career. He was a good singer but he told me he knew many of the old stars who were famous but died broke. Chester was based out of Modesto and owned a string of television stations in Northern, CA and Oregon. Best advice Chester ever gave me "Glenn I don't get involved in a business venture unless I have 100% control." A mantra I adhere to religiously if I have any say so in the matter. STUDY OF THE BAKERSFIELD SOUND! Son of the Father, of Bakersfield Sound. By Hank Ray ... BUCK SHOT - FEEL THE BLAST!! Merle is back out on tour starting June 17, 2008 in Norman, OK. Merle is pumped up and excited about this current tour and has said he feels he is singing better than ever and feels reinvigorated after a well deserved rest at home spending time with his loving family. Go get 'em Merle. 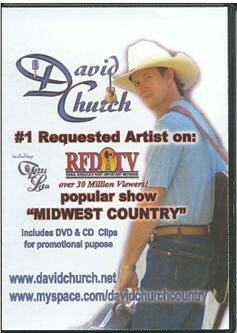 David Church will be performing on the "Midwest Country" show on these dates: June 28, 2008 and July 05, 2008. A tribute to the quaint town of Bakersfield, California... loved by some, but not understood by most. You will park a mile away from an entrance just to have your car parked under a tree. Instead of people thinking you're "rich" for having leather seats, they think you're stupid. You laugh when people complain about 95 degree weather. You're not worried about the big "California fires" cause by the time it gets any closer, they close the Grapevine. You've seen the "Stairway to Heaven" lights" while coming back to Bako at night on the Grapevine. You know to call it "Bako" and why we call it that. You know what "White, Ming, Rosedale, Calloway, and Panama" mean. When you go out of town & you see a sign saying "Union Ave" you lock your car doors. Rosedale is a world all its own. Rosedale ALSO needs to be turned into a sitcom. And if you live in Stockdale? OC ain't got NOTHIN on us baby...except maybe an ocean. You remember the TWO times in the last 25 years that it snowed in Bakersfield, and you remember everything you did that snow day. Everyone always says they're going to leave, but you know that if you try, you get sucked right back in. You take the "California Roll" to a whole new level. You know where all the "haunted houses" are when Halloween comes around. You know what an "08er is", where "the Dale" is, and who a "Daleon" is. You know Trouts, and were not talking about the fish. People who actually MADE it out of this city sit here & laugh at these because they know they're TRUE. One of your friends owns a house on a spot where you had field parties in high school. You know the ingredients in a George's Special, or may have had a "Black and White" for lunch. You get mad every time you see "Best of Times" when Taft wins at the end. You comment on how expensive Mexican food is in any other city in the country and, more than that ... how terrible it tastes everywhere else. You have offered someone a "Dewar's Chew". You know if you're not at Luigi's at exactly 10:30 Saturday morning you're not getting a steak sandwich. You claim to hate LA but go there at least every other month. You have debated the merits of water skiing at Lake Ming versus Buena Vista. You have to explain to friends from out of town what animal a tri-tip comes from ... and when they don't believe you ... you can't prove it as no other butcher shop has them. You think beans and salsa go with everything. You think a restaurant is chintzy if it doesn't come with soup, salad, spaghetti, and fries. You think a red light is just a suggestion. The best restaurants in town serve pickled tongue! You think $600 a month for rent is way too high. You know the pool is usually warmer than you are. Anywhere that takes longer than a 10 minute drive is way too far. You think you're better than people from Fresno. Someone mentions "the fair" and your thoughts turn to Cinnamon Buns, First Christian Church caramel corn, and Boy Scout potatoes. You have to "explain" to someone about Beach Park. Someone from out of town talks about how foggy it is and you chuckle & tell them, "Just wait." You drive just as fast on a foggy day as you did yesterday when it was clear. You swear that just last week there was an orchard where there is now a whole development of houses. You actually get these jokes and pass them on to other friends from Bakersfield....the rest will be just scratching their heads. Desert Rose Band has reunited to record and do some touring. 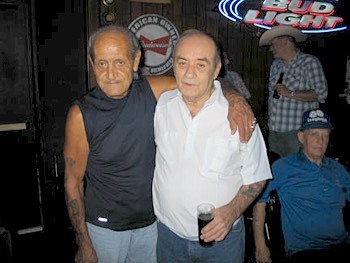 Chris and Buck were quite close for many years, and Buck made what was probably his last public appearance at the Chris and Herb show a week before he died. Chris was also part of Dwight Yoakum's Buck tribute band at the ACM awards show last year. Also posted on the "tours" link at the Desert Rose Band Reunion gigs. To all my friends in Bakersfield: I will be attending the Bakersfield Sound Pioneer Awards at Trouts Nightclub June 6-8th, 2008. Hope to see you there. Glenn P.
Michael Henson son of legendary Cousin Herb Henson will be performing at Trouts Nightclub in Oildale, CA. Trouts is located at 805 North Chester Ave. Dates are June 6th and 7th, 2008 at 7:30 pm. This is a rare treat so don't miss this performance. An interview with Red Simpson and footage from the former Buck Owens Studio. I wanted to share the fact that last nite I found out that one of our rock greats and a great friend to me passed away February 26, 2008. Why am I so late to note the passing of Buddy. Well a couple of days ago I e-mailed his lady Sherrilae to see how her and Buddy were doing which I would do every three or four months. Well I got home late last night and I received an e-mail from Sherrilae saying "Glenn you need to call me. I guess you have not heard the news yet." 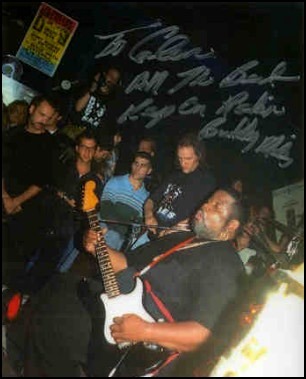 Realizing something serious had transpired I logged onto www.buddymiles.com and the sad news was posted. I literally cried reading the news as Buddy was only 60-yrs. old and was touring and recording the last time I spoke to him and Sherrilae. 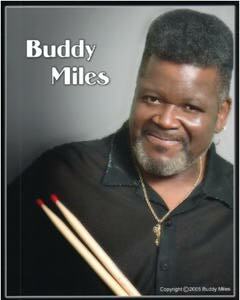 In case you don't know Buddy had his own band called the Buddy Miles Express. He used to perform in Bakersfield at the Bakersfield Civic Auditorium and he and his band wowed me with their energy. I later learned many of Buddy's songs on my guitar and played them in various bands I was in. His biggest hit was "Them Changes." Later on in his career he recorded a live album with his dear friend Jimi Hendrix and bass player Billy Cox called "Band of Gypsys"which is a classic rock album now. I called Sherrilae and she told me he was cremated and she is going to spread his ashes in various parts of the world. I will miss Buddy but his music will live on for centuries. RIP dear friend and you and Jimi are rockin' Heaven now for those angels that love Rock N' Roll. I'm sure God is tappin' his foot too for after all God loves a little Rock N' Roll too. 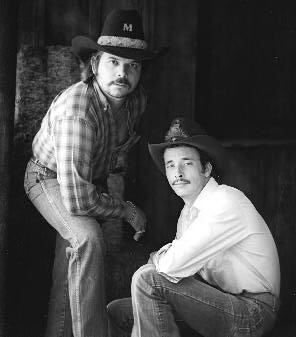 ... Glenn P.
NASHVILLE - Jim Hager, 66, one half of the Hagers duo, died Thursday after an apparent heart attack. He was found collapsed in the parking lot of the Frothy Monkey coffeehouse and was pronounced dead at Vanderbilt University Medical Center around 6 p.m., May 1, 2008. With his twin brother Jon, Jim Hager rose to national fame in 1969 when they joined the cast of a new variety show featuring country music and a satirical take on country living. Hee Haw went on to become a top-rated syndicated program. And, when the Hager brothers left it in 1988, they were the recipients of more fan mail than any other cast members in the show's history. 1. Men never hit your woman or your children. It hurts physically and emotionally. 2. Be friends with your wife. Support and love her. Your home is your fortress against a troubled world. 3. Always emphasize positive reinforcement as opposed to negative reinforcement with friends and family. 4. Never do anything your children would be ashamed of you. Always set a good example and a high standard to always remember "Always treat those as you would treat yourself". 5. Never use innapropriate language around women and children. I know it's hard for us men with our rough and rowdy ways. April 30, 2008 - One of Bakersfield's claims to fame will close it's doors for good. At midnight Wednesday, Fat Tracks recording studio on North Chester in Oildale will no longer be used as a studio. The studio became famous after country music legends like Buck Owens, Merle Haggard, and Dwight Yokum used it to record hits. The original "Streets of Bakersfield" was recorded there back in 1972, by singer-songwriter Homer Joy. It has been more than 30 years since Joy has been in the studio. Wednesday, he took one last look at the place that put his song on the road to becoming a chart topper. Singer, songwriter Homer Joy said, "'Streets of Bakersfield" just made everything all right. It was all right for everyone. It has been such a blessing over the years to Buck. Just a whole lot of people who can remember back or do remember to the time and that song we have really, really good memories." Another masterpiece by famed Bakersfield painter Patti Doolittle. 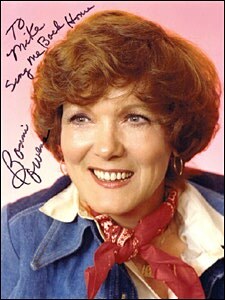 Her rendition and tribute to the "Queen Of Bakersfield", Miss Bonnie Owens. "Greetings, I've been a BIG fan of the Bakersfield sound. Growing up in nearby Arizona in the 60's country music was always on the radio at my house so I got to hear some great music from BUCK OWENS, MERLE HAGGARD, WYNN STEWART, TOMMY COLLINS, and many others. My name is Jim West. I've spent over 30 years in country music radio. One of the highlights of my career was working for Buck Owens, son Michael and program director Larry Daniels at KNIX-FM radio in Phoenix. Like KUZZ in Bakersfield, Buck owned this legendary station for over 30 years. We were consistently #1 and well respected in the music industry nationwide. Currently I am on the Advisory Board of the ARIZONA MUSIC AND ENTERTAINMENT HALL OF FAME. In 2007 we inducted another class of entertainers who had ties to the state of Arizona. Buck Owens was among those inducted. It was my honor to (along with Larry Daniels) present son Buddy Alan Owens an award on behalf of his dad. Buddy Alan also performed that evening. Shortly after our Hall Of Fame awards show the Owens family graciously presented a BUCK OWENS Red, White and Blue acoustic guitar to me. What an honor. Buck would hand these guitars out to friends and entertainers for many years so I am proud to be in the fraternity of folks who now own one. Many thanks to the Owens family. I continue to promote country music and the Bakersfield sound through freelance articles and on the radio." Editor's note: There is an unsubstantiated rumor Merle will be in attendance. 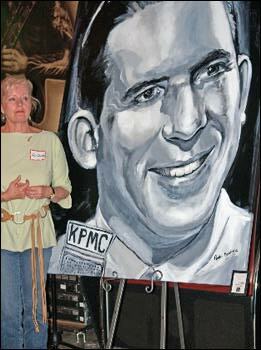 Here's a marvelous rendition of Billy Mize by famed Bakersfield artist Patti Doolittle. Bravo Patti ... Glenn P.
Mike Henson and Marty Haggard, circa 1982. Mike is the son of Cousin Herb Henson. 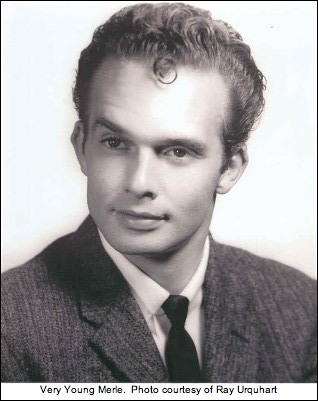 Marty is Merle Haggard's eldest son. The kid with the red hair is Merle's new lead guitarist and Merle's pride and joy ... son Binion Haggard. That is the back of Norm Hamlet's head, Binion, Merle and Scott Joss on fiddle. This picture was taken by me at the Fox Theatre in Bakersfield,CA on 02/13/2008 ... Glenn P.
NEWS FLASH ! We got a telephone call from Kelly... He had just had a "mild" confrontation with a guy over in Arizona... At the time we talked to him, they were still waiting for the guy to wake up, to make sure he was alright. Honest Shelly, he was only trying to explain to the guy, it's not nice to use 4 letter words. The guy did finally wake up. And, I think he totally understands the importance of a good vocabulary now...So how about I set up another date ? 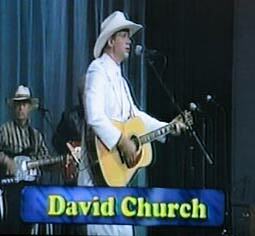 David Church performing recently on www.midwestcountry.com broadcast on Saturday nights on network www.rfdtv.net. Midwest Country has a viewership of over 60 million people worldwide. Dave's next scheduled performance on "Midwest Country" is April 19th. Log onto www.davidchurch.net and click onto David's tour schedule. He currently is performing in the Midwest and Canada and tentatively scheduled for several performances in California as well as Ohio, Indiana, Illinois, Missouri, Kansas, Colorado, Utah and Nevada in July of 2008. 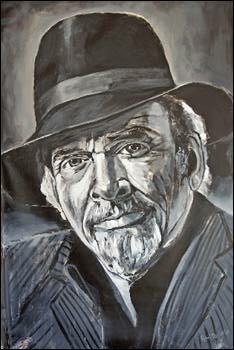 Patti Doolittle's latest creation: Mr. Merle Haggard hanging at Trouts Nightclub located at 805 No Chester Ave, Oildale, CA. NASHVILLE - Isn't this a marvelous looking couple? My dear friend and That Bakersfield Sound Website Manager Bob Timmers and his lovely life soulmate Dianne Duran - Glenn P.
Bakersfield artist Patti Doolittle standing next to a painting of the legendary Cousin Herb Henson. Patti painted this masterpiece. It's no secret I am a big fan of Hank Williams Sr. After listening to David Church's tribute to Hank titled "A Legend Froze In Time", it struck me that Hank William's soul inhabits David's body. I swear to God you are listening to Hank Williams Sr. thru David's deliverance of some of Hank's big hits. I was awestruck. You can see David perform monthly on the RFD network (www.rfdtv) on a show called Midwest Country (www.midwestcountry.com). David is based out of the great state of Ohio and is represented by Titan Talent & Management. His April-May-June tour is currently being set up. If interested in booking David at your venue, contact titantalentmgmt@aol.com for an electronic press kit and details on fees charged for performance. 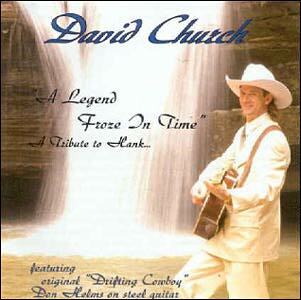 You can purchase David's CD at www.davidchurch.net. Trust me, you're in for a real treat ... Glenn J. Pogatchnik aka The Ambassador of The Bakersfield Sound. The Original Bakersfield Sound Pioneer Cousin Herb Henson back onstage at Trouts Nightclub. Mural by local Bakersfield artist Patti Doolittle. Picture sent to us by Michael Henson son of Herb. Michael now calls Oklahoma his home. to start this website back in 1998. 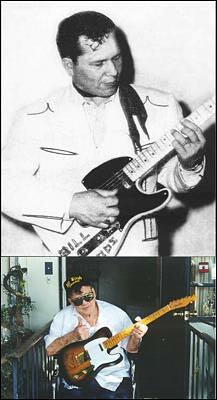 Bill is known as the "Grandaddy of the Bakersfield Sound. He passed away April 30, 2000. 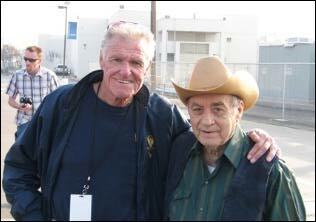 Actor Charles Napier and Sonny Langley. Photo taken in Bakersfield on Feb 13, 2008. Sonny Langley - Mack Owens (brother of Fuzzy Owen) - Loretta Owens (sister of Bonnie Owens) backstage at Merle's concert at the Fox Theatre in Bakersfield Feb. 13, 2008. 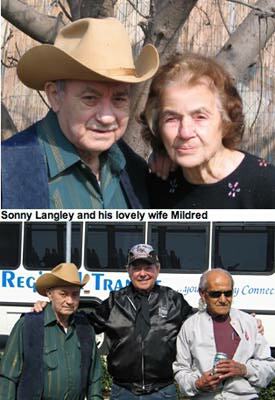 Ray McDonald (limo driver) - Mildred Langley - Sonny Langley - Sonny O'Brien on the way to the Merle Haggard Drive ceremony held on February 13, 2008 in Bakersfield. NOEL HAGGARD backstage at the Fox Theatre in Bakersfield Feb 13, 2008. Noel was the opening act for his father. He's a fine singer in the family tradition. 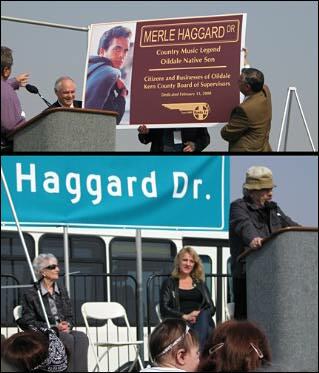 On Feb 13, 2008 Oildale native son Merle Haggard attended an ceremony dedicating a street named after him named Merle Haggard Drive. In attendance were over 1,000 onlookers. Merle spoke at the function with his family Theresa (wife) Binion (son) and daughter Jenessa as well as Merle's sister onstage behind Merle as he spoke to the audience. He was given a plaque and a Harley Davidson one of a a kind Silver Wings jacket as well as being told there would be a permanent marker called "Hag's Place" for tourists to visit in the future. Well, our roving Ambassador of The Bakersfield Sound" Glenn was in attendance and videotaped the 32-minute ceremony and was besieged by many in attendance for a dvd copy. After further investigation he found out he could have copies made at a cost to the fans at $19.95 (plus $3.50 shipping and handling). Also included in the video is an eight minute clip of Merle attending and signing three Telecasters to be donated to a charity auction to benefit a new wing at the Bakersfield Memorial Hospital called the Ronald McDonald House. If you are interested in purchasing a dvd of these two functions send $23.45 by cashiers check, money order or paypal to Glenn J. Pogatchnik, 1675 Los Osos Vly Rd., Unit 130, Los Osos, CA 93402. Allow two to three weeks for delivery. "Live At The Blackboard" CD Available at Trouts. Just wanted to let you know that Merle Haggard is selling a CD of Merle Haggard and the Strangers Live at The Golden Nugget Circa 1966. I picked up one at the Last of the Breed Show, which is the only place I've seen it for sale. It is a great CD that would be appreciated by those fans of the Bakersield Sound. It features a young Merle and the original line up of the Strangers, along with Bonnie Owens, Fuzzy Owen and Kenny Vernon. The fidelity is surprisingly good. This rare recording is truly a gem! 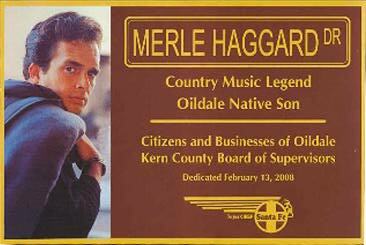 On Feb 13th, 2008 Merle Haggard, a man I'm proud to call friend, was honored by his hometown Oildale, CA. He took stage on a road named Merle Haggard Drive to accept the honors bestowed upon him. As usual he was humble and humorous as several dignitaries and friends recounted his phenomenal talent as a Country Icon. He was presented with several presents as well as a promise to build a permanent marker called Hag's place for people to visit. As I sat there I was overwhelmed by the love the crowd that attended focused toward Merle. Many of his friends were there as well as his children Jenessa, Binion and his wife Theresa. His sister Lillian who resides in Bakersfield was on the committee that eventually convinced the city of Bakersfield that Merle deserved a road named after him a honor that was bestowed on his pal Buck Owens several years before. "I'll Never Swim the Kern River Again" by Merle Haggard. Here's a picture of the mighty Kern River that has taken many a lives over the years because under the placid surface is a turbulent life threating torrent. It starts at Mt. Whitney in the Sierra Nevada mountains and ends at Lake Buena Vista west of Bakersfield ... Glenn P.
We would like to note the passing of our dear friend Loran Nightingale who passed away recently from congestive heart failure. 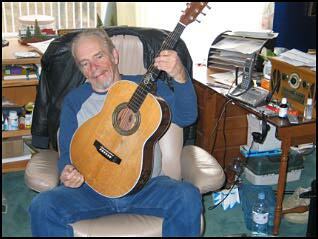 Loran led a very colorful life with many diverse occupations including singing country music. If you scroll down this page we have posted a book called "When Broken Wings Heal" which Loran wrote. He told us his proudest accomplishment was defeating his addiction to alcohol. R.I.P ol' friend. 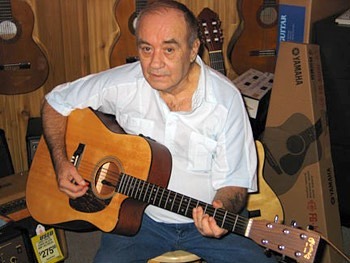 Homer Joy wrote "Streets of Bakersfield" many moons ago when he was signed to Buck Owens Enterprises and Blue Book Music (the publishing arm of Buck's company). Because of that famous song, many assumed that Homer lived in Bakersfield, California. Not true. Although Homer stayed for extended lengths of time when he was working with Buck Owens, he never lived there. 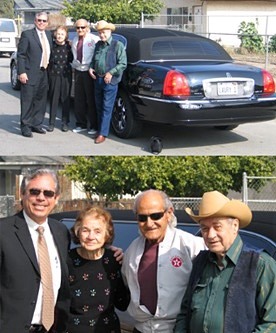 In 2008, that has changed and Homer Joy has returned to the "Streets of Bakersfield" to call the place home. "During those 6 years, I came in and out of Bakersfield frequently, but I never once lived here. I love the people in this town. They have been very good to me through the years," stated Homer when asked about his move from Oklahoma to California. "It was time and it was all made possible by Tom Rockwell, the man behind the scenes at Trouts. Rockwell is an amazing and persuasive man. Rockwell is the first and only person to ever convince me that living here would be the thing to do. He is the reason I am here now. I love working with him and he has some very great and exciting ideas that will be good for everyone involved in Country Music on the West Coast ... of which I hope to be a part." "It is honored to play even a small role amongst the entire Bakersfield community that has reached out with open arms to welcome the man, and his family, who has injected more than his heart and soul," acknowledged Rockwell when asked about Homer Joy moving to Bakersfield. "He gave us our national 'Bakersfield Anthem'." Homer is busy putting his new band together for a tour as his current single, "John Law" sits a top of the Indie Charts. More singles will be released in 2008 from Joy's CD Someday It'll Be Country. For more information on Homer Joy, please visit his website at www.homerjoy.com/ or at www.myspace.com/joyhomer. Here's our good friend Rick Dotson from Oregon sporting his new Merle Haggard Signature "Tuff Dog" Telecaster. To give you a rough idea of the quality and expense of this instrument Rick purchased the guitar for $600 more than what I paid for my 1967 Pontiac GTO back in 1967. -Glenn P.. I have enjoyed your website on Bakersfield and the music immensely! 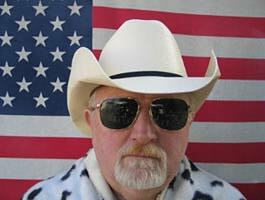 My name is Jim West and I had the priviledge of working for Buck Owens when he owned Phoenix radio station, KNIX-FM. I spent 8 great years there working for son's Michael and Buddy Owens. They taught me alot about radio and I have gone on to have a very successful country music radio career for the past 32 years. I am currently working at KMLE Country 108, another Phoenix country station. Anyway, I am on the Advisory Board of the ARIZONA MUSIC AND ENTERTAINMENT HALL OF FAME... (SEE: www.azmusichalloffame.org) in September of 2007 we inducted several people who had an impact in entertainment in Arizona in all forms of music ... and we inducted Buck Owens. Buddy Alan Owens performed a medley of his dad's songs on stage. I was honored along with my old program director at KNIX, Larry Daniels to present Buddy our award on behalf of his dad. It was a special night of entertainment. 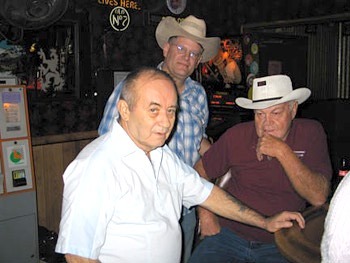 We also honored a couple of great country nightclubs in the Phoenix area and even the late REX ALLEN Senior. Shortly after our show I was presented with one of Buck's RED WHITE and BLUE guitars from Michael Owens and the entire family. Like Storme Warren, I can't play a lick, but since growing up in the Arizona desert in the 60's the west coast country music has been ingrained in my soul like thousands more people...! It was one of the best Christmas Gifts I could ever get from the family of someone who I have respected and been a big fan of. Working for Buck at his former Phoenix radio station was the Icing on the cake...! Thanks for your time and keep up your good work on your website. Here are our two friends Merle Haggard and Sonny Langley performing at a club called Fishlips in Bakersfield on Sunday Jan 6th, 2008.The event was a private birthday party that Merle put together for his doctor MC Barnard that practices in Bakersfield. The doctor was Merle's doctor many years ago when Merle resided in Bakersfield. A note of interest is the acoustic guitar that Merle and Sonny are playing was given to Merle by Randy Travis. Pictures sent to us by Howell House. http://community-2.webtv.net/Howell64/MyMerleHaggardPhoto/ is an updated version of a tribute page to Merle Haggard by our friend Howell House from Morristown, TN. 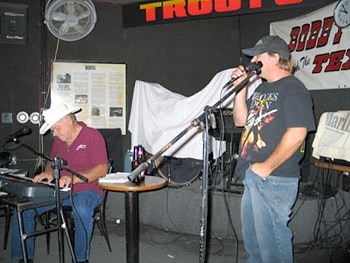 Our friend Tom Rockwell, business manager at Trouts night club, has created a website on MySpace dedicated to the Bakersfield Sound. Log on to the the site and join in on the fun. We welcome another site dedicated to the Bakersfield Sound. Sonny Langley and Heather Myles performing on the new "Blackboard Stage" at Trout's on Nov. 9th, 2007. They are two of the best singer/songwriters in the music business and we're sure the crowd was thrilled by their performance. George to me in this song has captured the essence of the question I get all the time. How did the Bakersfield Sound come to be? When you log onto www.georgehighfill.com you can read about Mr. Highfill's illustrious career. You can also order the Cd "Music Born In Bakersfield" at this site. 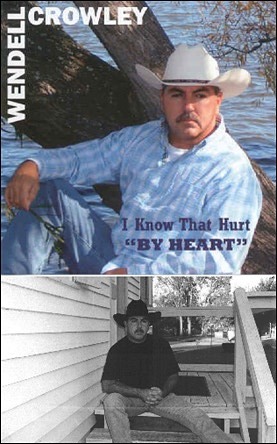 George hails from Oklahoma but makes his home in the Los Angeles, CA area where he recorded this Cd with the help of Pete Anderson producing and playing guitar (Pete is the former guitarist/producer for Dwight Yoakam). Also Scott Joss(current fiddle player for Merle Haggard) plays on the CD as well as Skip Edwards on pedal steel. There is a total of ten songs (seven written by George) which feature that stripped down traditional Country sound that Buck and Merle made famous. George is one of those rare artists that can sing with conviction about all the various emotions that us fragile humans experience thru the course of our lives. About the good times and bad times and how hopefully it all works out in the end. Well done George. (c)2003 Fandango Music Pub Co.
Haggard Brings Bluegrass to "Big City"
Here's Merle Haggard Drive and Airport Drive (formerly 7th Standard Rd.) looking back (south) at Oildale the birthplace of Merle. 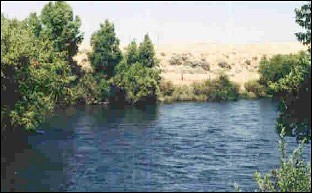 Beyond Oildale is Bakersfield separated by the mighty Kern River. Photo courtesy of Don and Debbie Thomas. It's no secret we are huge fans of Western Swing music and especially quality fiddle playing. As Bill Woods was the "Father of the Bakersfield" just up the road from Bakersfield there was the legendary Dave Stogner which in my humble opinion was the "Father of the West Coast Swing Sound." Bill and Dave were lifelong friends and had much in common. Back in the 50's Bill started the Cousin Herb Henson TV show. Dave also had a TV show in Fresno, CA north of Bakersfield. If you log onto www.rockabillyhall.com/DaveStogner.html you will be mesmerized by Dave's musical accomplishments and many of the legends he collaborated with over the years. 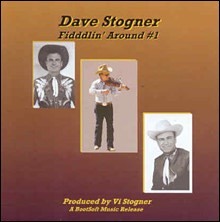 This CD is a must for those of you who love good country singin' and masterful fiddle playing. You can purchase the Cd at www.cdbaby.com. Our thanks to Viola Stogner, Dave's widow, who kindly sent this CD to us. (6 x CD box-set plus large hard back book, 165 tracks on this set which is a follow-up to the 'Untamed Hawk' set. Also has 20 unreleased performances. A true legend of American music captured in his prime! *** The follow-up to Bear Family's hugely acclaimed 'Untamed Hawk' set. *** All the studio recordings between 1969 and 1976, including 15 straight #1 country hits. *** Includes Vietnam era classics like Okie From Muskogee and The Fightin' Side Of Me, as well as the more moderate unreleased song Somewhere In Between. *** More than 20 other unreleased performances. 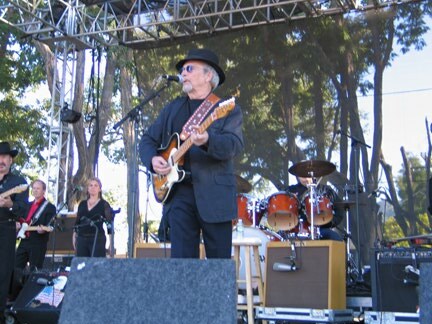 Merle Haggard occupies a unique place in American music. The man who gave voice to the Silent Majority went on to become a counter-culture favourite. He has scored hits in the 1960s, 1970s, 1980s, 1990s, and 2000s, and still works 200 sold-out road dates a year. Ever since Bear Family released 'Untamed Hawk' in 1995, we've been asked for a follow-up comprising the rest of his legendary Capitol recordings. This is it�on 6 CDs, and it covers the tumultuous years between 1968 and 1976. The only exclusions are his Jimmie Rodgers tribute (already issued on a single CD by Bear Family) and the live recordings, which will be released in a companion volume. These were the years when Merle Haggard polarized the USA with songs like Okie From Muskogee and The Fightin' Side Of Me, yet, as this set reveals, his approach to politics was more nuanced than many thought at the time. In an unreleased song (one of many) titled Somewhere In Between he says "I stand looking at the left wing, and I turn towards the right, and my eyes find both good and bad there on either scene ...." He adds, I'm not too old to understand the young who disagree." The unissued recordings also include his original version of That's The Way Love Goes, which became a big hit for him on Epic Records several years later. These were Merle Haggard's golden years when he gave voice to the voiceless, and scored an unbroken string of #1 hits. This is American country music� make that American music� at its finest. 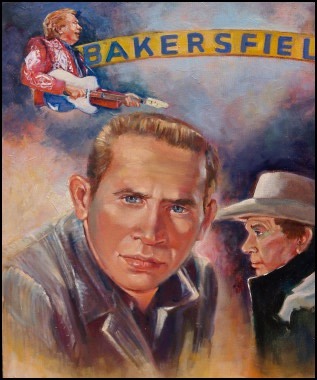 This marvelous portrait of Buck Owens painted by local Bakersfield artist Patti Doolittle will be available for viewing at the Bakersfield Museum of Art 1930 R. Street, Bakersfield, CA. Sept 13 - Nov 18th, 2007. Patti, an award winning professional artist, has a website: www.pattidoolittle.com. Here you will find many exquisite prints for sale that showcase Patti's brilliant talent. Trout's Nightclub located at 805 No. Chester Ave. (661)399-6700 in Oildale, CA now has it's own website at www.myspace.com/troutsnightclub. As you will see there are many photos and live video performances for your viewing pleasure. 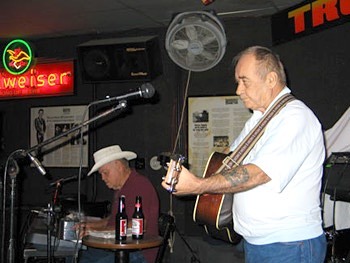 This Bakersfield venue is the last great honky tonk left that bears a close resemblence to the days of old when the Bakersfield Sound honky tonks reigned supreme. We were recently made aware of a website at www.slidestation.com/streets_of_bakersfield.htm of Jerry Brightman's contribution as a Buckaroo. He played pedal steel on the recording of the "Streets of Bakersfield," written by our friend Homer Joy. As you will see when you click to the site Jerry has provided us with a glimpse of that historic day when the song was recorded in Buck's studio on North Chester in Oildale, Ca. Best of all Jerry is currently still wowing the fans with his pedal steel playing prowess. More about Merle Haggard's new "Working Man's Journey" CD and The Hag's "True Discography" can be found here. Johnny Barnett one of the early Bakersfield Sound Pioneers passed away Monday June 4, 2007. He was 89. Johnny was best known as the bandleader at the legendary Lucky Spot located on Edison Highway in Bakersfield. Many notable musicians such as Gene Moles, Cliff Crofford and Billy Mize honed their musical skills at that club. A young upstart by the name of Merle Haggard was given the oppurtunity by Johnny to perform at the Lucky Spot one night when Johnny finally succumbed to fatigue from two daytime jobs. Merle then became a regular performer at the Lucky Spot. Johnny was a fine singer and had recorded several records throughout his musical career. He was one of Bakersfield's best and will be dearly missed by all that had the priveledge to have known him. > Buckaroo Doyle Holly R.I.P. 1/13/07 - Doyle Holly passed away this morning after a long battle with cancer. 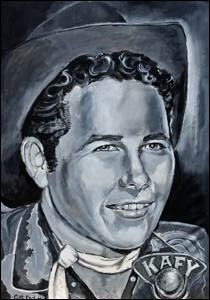 Doyle Holly Born Perkins, Okla. -�June 30th, 1933 / Died Nashville -13 January 2007. There will be no memorial service. Doyle's request�was to be cremated. "Doyle has asked me to convey to all of his wonderful family, friends, and all who have prayed for him, that he truly feels and appreciates everyone of their prayers, concerns and well wishes. It is difficult at this time. He has valiantly fought the cancer for nearly 5 years. He is resting in peace now with the Good Lord and there is no pain." - Doyle's wife Ginny. Russell proposed to record an album of bluegrass-influenced versions of Buck Owens hits with Holly on vocals. Unfortunately, Russell's health declined sharply when recording was about two-thirds completed, and the album was shelved until OMS label head Hugh Moore stepped in to revive the project following Russell's death in 2001. "Hugh Moore (who also contributes banjo to the album) is a bluegrass producer," says Holly. "His forte is bluegrass, and I love bluegrass. It was supposed to have been a little more bluegrass than it was. I tried to get more of Del McCoury's band on there." Released in early May by OMS Records, "Together Again" is a fine blend of bluegrass and Bakersfield featuring ' fel low ex-Buckaroos Brumley and Cantu as part of the core band, as well as Owens himself on two duets with Holly; "Foolin' Around" and "Love's Gonna Live Here." Also appearing as duet partners are Bobby Osborne and Jeannie Seely. Perhaps surprisingly, Holly doesn't play bass on the new album, explaining, "It's because I haven't done it for a while, although I do still have one. And we had Mike Bub, Del McCoury's bass player. I was busy doing vocals, so I never did give it much thought." The only member of the classic Buckaroos lineup absent from "Together Again" is guitarist Don Rich, who died during the summer of 1974 in a motorcycle accident at the age of 32. Rich's death was devastating to Owens; both personally and in terms of his career. Holly still clearly misses Rich as well. "Don was just a great big old teddy bear who'd set the world for you," says Holly. "I remember an incident where somebody called up Don about two or three o'clock in the morning and said, 'My battery's dead. You've got to give me a jump.' And (this person) figured Don knew who he was talking to. So he said, 'Yeah, I'll be there in a minute. Tell me where you're at.' He gave him the directions where he was at, and Don got up to get ready and said, 'By the way, who is this?'" Although Holly's new album marks the only occasion on which the four surviving members of the classic Buckaroos lineup have recorded together since 1967, he says that RCA Records had approached him about recording a Buckaroos reunion album in the early '90s. Though the project never got past the planning stages, the idea had been to reunite the group's famed '64-'67 lineup, as well as bringing in other ex-members. "They wanted me to get all the original Buckaroos, plus a few other musicians who'd worked with Buck. As a matter of fact, one of the ideas was to make 'Together Again' an instrumental with Tom Brumley, Ralph Mooney and Jay Dee Manness," the last two of whom had also played on Owens' '60s recordings. "Probably it didn't happen fast enough for RCA," says Holly when asked why the project never saw the light of day. "Somebody was probably dragging their feet. I was probably one of the guiltiest. I know there was a problem with using the Buckaroos name. Buck had a patent on the Buckaroos name, and he had a project going where he couldn't release permission to use the name." During the group's mid-'60s peak, it seemed like everyone was a Buckaroos fan; none more so than the Beatles, who covered Owens' 1963 hit "Act Naturally" (the Buckaroos returned the compliment with a spirited cover of "Twist and Shout" on 1966's "Carnegie Hall Concert" while wearing Beatles wigs) and who, it is said, had a standing order for all new Buck Owens records to be forwarded to them in England. "We went to a brunch with Ringo and John in Liverpool. I didn't stay very long because I wanted to ride a steam locomotive. Don was a big Beatles fan. I was a fan, too, but not as big as Don. If I had to do it over, I would have stayed there and eaten with them." Asked to name his favorite Buckaroos album today, Holly says, "Beyond a shadow of a doubt, the Carnegie Hall album. The album is still selling very well. The shows were oversold. The people came to Carnegie Hall in their tuxedos and evening gowns, and they had to sit in the aisles." "Carnegie Hall Concert," in some respects, represented the high water mark for Buck Owens and the Buckaroos. Owens and his crew were only the second country band to record a live album there (following Flatt & Scruggs' lead in 1962, and the album captures a flawless performance from the group. Although Holly says - perhaps surprisingly - that the album is a little more laid back than a typical Buckaroos show of that era, he says that the group pulled back a bit on the reins for the Carnegie Hall shows since they knew that the performances were being taped. "We were nervous about being recorded," says Holly. "When you're doing a tape, you don't want to make any mistakes. We were probably more concerned with making the record than with entertaining the audience. I asked Buck if he wanted to do comedy and he said, 'No, just play everything straight.' Then it got back into the groove of a regular show, and we started doing the comedy and the impressions." And Holly took some pride in the fact that the records he played on have had such a lasting influence on later performers including The Eagles, the Desert Rose Band and The Derailers. "You bet. We weren't really country, although we thought we were. I would [say] that we were a bunch of bluegrass musicians with electric guitars. Don was so versatile. He dug the Beatles. He dug The Band ... in fact we recorded three or four songs by The Band." "If we heard a good song, we'd record it." 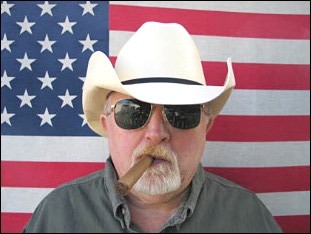 Our disc jockey friend Lil Lyle now broadcasts his Traditional Country Show called "Country Standard Time" live on the Internet on Sunday mornings from 6-10am (Pacific Standard Time). The website is at www.jugcountry.com. Left to right in the photo is Lil' Lyle (Merle Haggard on stage) and Lyle's program director Pepper Daniels. Listeners can e-mail Lil' Lyle at littlelyle@sbcglobal.net to request tunes on his Sunday morning Internet show. Billie Leona Hobbs Witherspoon R.I.P. We wanted to note the passing of Merle Haggard's first wife Billie Leona Hobbs Witherspoon who passed away July 9th, 2006 at the age of 66. Leona was born Dec 31, 1939 and resided in Oildale, CA at the time of her passing. She and Merle had four children together ... Marty, Dana, Noel and Kelly. She also had two other children James and Deena. Our condolences go out to her family. 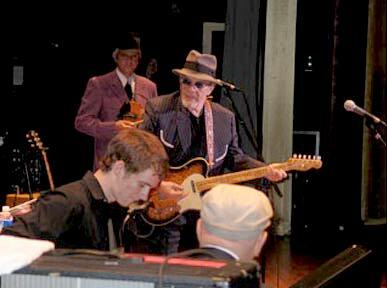 Photos taken from a performance on 5/25/06 at Buck Owens Crystal Palace. The upper left photo is Sonny Langley (local legend) performing some fine traditional country songs backed up by Fatt Katt and the Vonzippers. Bottom photo is Fatt Katt and the Vonzippers playing some of the finest rockabilly music on the West Coast. Fatt Katt was one of Buck's personal favorites. The upper right photo is Tommy Hays and his wife Kim looking on as the bands perform that night. 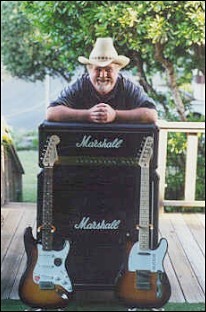 Tommy is one of the original Bakersfield Pioneers and is famous for his vocal and guitar playing prowess. 4/24/06 - Just one month after the death of country legend Buck Owens, there comes word that Bonnie Owens, 76, has passed away. The death of Bonnie Owens was reported Monday afternoon by Buck Owen's Bakersfield Radio Station KUZZ. She was the wife to both of Bakersfield country legends Buck Owens and Merle Haggard. Bonnie was born in Oklahoma City and met Buck in a roller rink in Mesa, Ariz. and they were married in 1948. 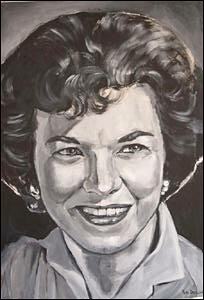 She was the mother of Buck's two sons, Mike and Buddy Owens. However, the marriage to Buck did not last and the two divorced. Like Buck, she was a country singer and after the divorce from Buck, she became closer to Merle Haggard. The two married in 1965 but that marriage dissolved in 1978. Family spokesman Jim Shaw said she passed away from complications of Alzheimer's.
" She was married to the two best-known instigators of a 20-year music phenomenon. She sang in the two smokiest, twangiest honky-tonks of the era. Heck, she even served drinks to the fruit-pickers and oil-field workers who truly made the Bakersfield Sound what it was.
" Bonnie Owens, the former wife of both Buck Owens and Merle Haggard, had a front-row seat for a wild, influential chapter in American music history, and she's grateful for it. But talk about coincidences.
" Bonnie Campbell was born in Oklahoma City to a pair of sharecroppers, one of eight children. 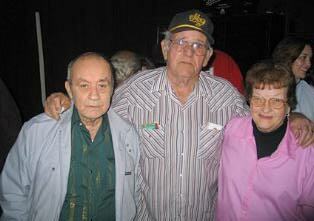 She first got to know Alvis Edgar "Buck" Owens Jr. at the Mazona Roller Rink in Mesa, Ariz., in about 1945. "He was a pretty good roller skater," said Bonnie, just 15 or so at the time. "But I liked him because he played guitar." " The two dated, but Buck, who is six weeks older, was surprised nonetheless when he showed up for his daily 15-minute radio show, "Buck and Britt," co-starring Theryl Ray Britten, and there was Bonnie. "What're you doin' here?" he asked, assuming she'd come to watch him. "Singin'," she answered. He didn't even know she could carry a tune.
" In 1947, Buck helped Bonnie get a job singing with him on another radio show, this one starring Mac MacAtee and the Skillet Lickers.
" By January 1948, they were married. Son Alan Edgar "Buddy" Owens arrived on the scene five months later, and Michael Lynn Owens, their second son, was born in March 1950. Buck picked oranges; Bonnie stayed home with the kids.
" But by 1951 it became evident that the marriage wasn't working. Bonnie and the two boys left for Bakersfield, moving in with Buck's favorite aunt and uncle, Vernon and Lucille Ellington. Buck arrived soon afterward, closely followed by his parents.
" Buck set out to look for work in the local saloons, and it didn't take long for him to hook up with steel guitarist Dusty Rhodes and, four months later, Bill Woods and the Orange Blossom Playboys. It wasn't quite so easy for Bonnie, who had to take a job carhopping at a hamburger joint at Union and Truxtun avenues. Buck's aunt took care of the boys while Bonnie served up chili dogs and chocolate-malteds.
" Buck and Bonnie remained legally married, though they were separated, because neither could afford a divorce. "And besides," Bonnie said, "we had one good thing in common. That was Buddy and Mike. We both wanted to make sure they had adjusted minds. It was a friendly parting." One day, Thurman Billings, the owner of the Clover Club, came into the drive-in with his wife and asked if Bonnie would like to be a cocktail waitress. They knew Bonnie already, having seen her sneak her way onto the Clover Club stage more than once to sing alongside Fuzzy Owen and his cousin, Lewis Talley. 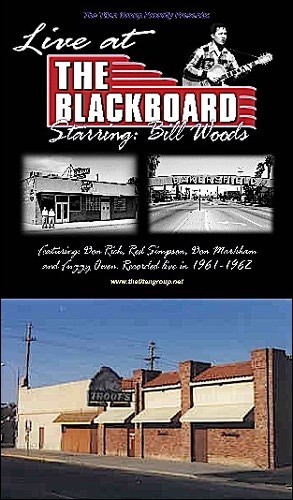 He knew she had also sung a little at the Blackboard, with Bill Woods' permission. "Anytime you want to sing," Billings told Bonnie, "you get up and sing." " And so she did, setting down her cocktail tray once or twice a night to perform next to Fuzzy, Lewis and other performers: Sometimes fiddler Jelly Sanders, sometimes guitarists Billy Mize or Roy Nichols. She did the same at the Blackboard, where Woods was the boss up on the stage and senior cocktail waitress Anna Mae Carlson was boss down on the floor. Bonnie's sister, Betty Spence Bryant, was one of the veteran waitresses.
" When Cousin Herb Henson, a prominent local disc jockey and occasional honky-tonk piano player, landed his "Trading Post" TV show on KERO in September 1953, the entire Clover Club band, Bonnie included, became the program's house band.
" Bonnie sometimes picked up her children from school and brought them to the television station for the live broadcast, which started at 5 p.m. Afterward, she'd go home and cook dinner for the boys before leaving for her waitressing job.
" Bonnie eventually recorded songs on the Mar-Vel label with sometime boyfriend Fuzzy Owen and his band, the Sun Valley Playboys. She later cut a well-received duet album with Owen on Lewis Talley's label, Tally Records (later released on Capitol Records), titled "Just Between the Two of Us." But even after she began placing records on the charts, she continued waitressing at the Clover Club and the Blackboard when she wasn't out performing on the road.
" In 1961, while slinging screwdrivers and Schlitz beer at the Blackboard at night, she caught a young singer she'd seen once before, at a Lefty Frizzell concert at the old Rainbow Gardens dance hall. It was Haggard, whom Frizzell had allowed up on stage that night in 1953. But Haggard had been out of circulation for a while, with good reason - he was just a few months out of San Quentin prison, having serving a 21�2 year sentence for burglary.
" 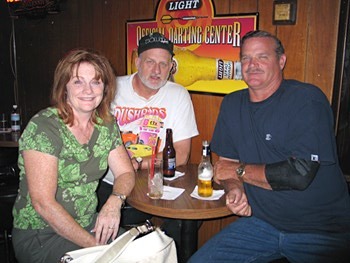 She introduced herself to Haggard that night, but the two didn't get to know each other well until Haggard put in a guest appearance on Cousin Herb's "Trading Post." " Soon afterward, Fuzzy, who by this time had become Haggard's manager, suggested that Bonnie and Merle re-cut "Just Between the Two of Us," and in 1964 they did just that. "We'd sent records to disc jockeys all over the country, and we'd include hand-written notes in each one," Bonnie said. "I was in touch with every disc jockey in the country. When we started doing it, we'd put Merle's record in with mine. It wasn't long until I was putting my record in with Merle's." "Just Between the Two of Us" was their first and only hit together, spending 26 weeks on the charts before it was overtaken by "(My Friends are Gonna be) Strangers," which proved to be Haggard's breakthrough song.
" The two songs got the attention of Ken Nelson, the A&R man for Capitol Records, and in April 1965, with Fuzzy's blessing and encouragement, Haggard signed with the label. But not all was well with Haggard. His marriage to Leona Hobbs was in a shambles, and his four children were living with Merle's mother. Bonnie was touring in Alaska, and Haggard missed her. He flew to Seattle and called her: Could he visit, and maybe look for some club work? She said OK. Two weeks later, on June 28, 1965, they were married in Tijuana.
" Bonnie had remained good friends with Buck, touring with his band on at least one occasion, in 1963. In 1965, the two crossed paths again, professionally speaking, when the newly formed Strangers (Merle, Bonnie, Fuzzy, Roy Nichols, bassist Jerry Ward and, soon afterward, "girl drummer" Helen "Peaches" Price, from Wynn Stewart's band) signed with Omac Artist Corp., a booking agency owned by Buck and his manager, Jack McFadden. Merle and the rest of the Strangers agreed they could do far worse than to retrace the footsteps of Buck Owens, who by this time was an undisputed chart-buster. Things were never tense among Buck, Bonnie and Merle, though no doubt their fans wondered about the trio's apparently overlapping love lives.
" "There was never animosity with Buck," Bonnie said. "Buck and Merle have always gotten along well ... I was broken up with Buck long before I ever met Merle, and there was a whole lot in between. I can't fathom either one, Buck or Merle, even thinking about it." " Bonnie had done some songwriting before she married Haggard, but under his tutelage, she began to blossom. She wrote whole songs, partial songs, small pieces of songs - and sometimes even got composer credit for writing nothing at all.
" "Merle wrote every verse of the song, 'Today I Started Loving You Again,' but he had another verse there that I thought didn't add anything," Bonnie said. "In fact it took something away. I talked him out of putting in those four lines, and he gave me half-writer credit." Their marriage lasted until 1978, although it was as good as over in 1974, when Bonnie stopped touring with the Strangers. The two separated for good in 1975, with Merle doing his best to romance Dolly Parton, whose "In the Good Old Days (When Times Were Bad)" he had recorded seven years earlier, at Bonnie's suggestion.
" But when Merle married Leona Williams in October 1978, the ink on his divorce decree barely dry, Bonnie was a bridesmaid. She eventually resumed touring with the Strangers.
" "I had a lot of fun being married to Merle, but we never should have been married," Bonnie said. "We were too good a friends. I was older, seven years older, and there was like a big sister thing going on. But there was a lot of mutual respect, too." " Today, Bonnie, 67, lives in rural Missouri, not far from the Arkansas line, with her husband of 16 years, Ridgecrest native Fred McMillen. She still tours regularly with Haggard and the Strangers, flying from Springfield to whatever city kicks off the tour; she then hops about the band's tour bus and sleeps in her own hotel room. Fred understands.
" She is thoroughly and genuinely modest about her own contributions and her own career, which include six solo albums and two duet albums with Haggard, including one of gospel songs, as well as Haggard's staggering catalog of recordings, most of which include her backing vocals. "I was a follower; Buck and Merle were leaders," she said. "I did what was needed and I did what I could. It was a great time, though. We thought we were as big as Nashville. We didn't have their recording studios and we didn't have the big radio stations, but we had the thing that was more than anything: We had the music." " She admits her diary could be a hot-seller, given her intimate association with Bakersfield's most two prominent musicians. "I'm very honored to be friends with both of them," she said. "But I never knew they'd be big stars, and I didn't care. When I like somebody, I like 'em all the way." " By Mayf Nutter - The Buck Owens funeral was at my church here in Bakersfield, Valley Baptist Church, where Buck has been a member for many years.
" It has grown into a large church yet the attendance is even larger, making two separate services necessary on Sundays to hold everyone who loves to worship God there. We are blessed with wonderful musicians for a full orchestra with violins, horns and the works. Our choir sometimes has 150 singers praising God and giving thanks for his divine favor and mercy in our lives.
" Like Disneyland, Valley Baptist Church has shuttles to bring worshipers from the far reaches of the sprawling�parking lots.
" Please consider this my personal invitation for you to join us for Sunday worship when you visit Bakersfield.
" 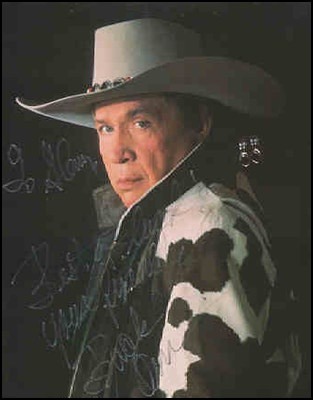 The funeral service for Buck Owens was scheduled for two o'clock in the afternoon on April second, 2006. The rain which had been falling steadily throughout the week stopped, as of� on cue, �to present a glorious sunny day with gorgeous puffy clouds and a clear blue sky. My beloved Sierra Mountains were clearly visible to the East and the stellar Tehachapi Mountains to the South.
" It was a beautiful, spectacular, and very emotional �send-off for my much loved friend and mentor.
" Herb Pedersen and Chris Hillman opened the service singing "TURN, TURN, TURN" accompanying themselves on mandolin and acoustic guitar. Beautiful.
" Our pastor, Roger Spradlin, gave the opening prayer followed by the Eulogy by Larry Daniels who was Bucks trusted man at his Phoenix radio station.
" Buck's recording of "DUST ON MOTHER'S BIBLE" set the tone for the celebration of Buck's spiritual life as a Born Again Christian, inspired and guided by his loving Mother who attended our church when it was a very small gathering of a dozen or so loyal souls. Now, Valley Baptist has the largest facility in Bakersfield with several additional�two story buildings for Sunday School classes, activities and offices.
" Brad Paisley had flown to Bakersfield from Memphis where he performed last night, arriving just in time to join us at the church. He was the first entertainer to sing during the funeral service, after giving a wonderful heart-felt testimony to Bucks influence and friendship to him. He sang using only his guitar for backing and was his usual personification of a Country singer pouring his song directly from his soul without pretense, flash or flourish.
" I am especially proud of Brad's success and the kind of man he has become. A fellow West Virginian, at our first meeting he told me his Mother had taken him to see a Mayf Nutter Show when he was around eight years old. Brad said he remembered that I had made it look like so much fun that he thought he would like to do that too. He also proudly told me that he had learned to play guitar, taking lessons from my guitar player, Roger Hoard, back in West Virginia.
" 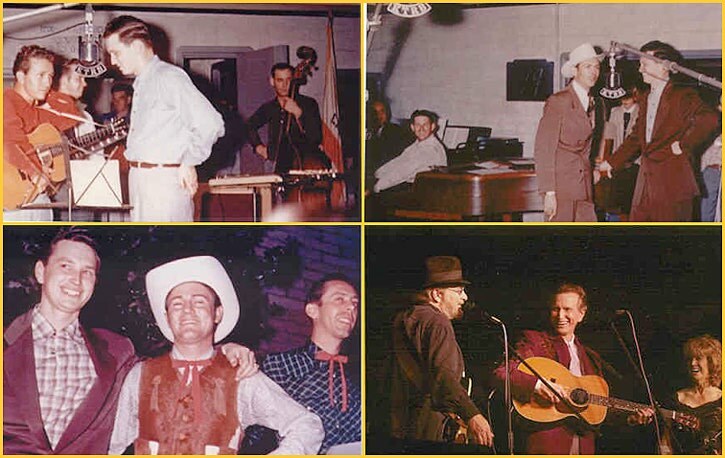 Buck's nephew, Mel Owens, Jr.�has�been�an integral part of management with Buck Owens Enterprises for many years.�He shared some memorable moments about his famous uncle.
" A perfect song choice for those of us who have been deeply grieving was, "BLESSED ASSURANCE". John Berry blessed us all with an amazing vocal performance without musical accompaniment. Splendidly done, faultless, very moving.
" Buck's youngest son, Johnny was a gangly Junior High kid when Buck brought me to live in Bakersfield.��Johnny is a handsome young man now who�lives at Buck's ranch. He is the ramrod there, loving it all.
" He told us about Buck's last day Friday, March 24th, 2006. Buck spent the day driving around inspecting the ranch he loved. Then�Buck had Johnny drive him,�along his musical instruments which he would use for that night's show, to the Crystal Palace. Johnny said�Buck decided to go to the Palace�unusually early on Friday, around 4 o'clock.
" Buck always wanted the fans to get their money's worth and more, whether it was food from the kitchen of his restaurant or the shows he and others did on stage. During our touring days together, he was always thinking of better ways to present the show to our audiences no matter if the venue was the Queen Elizabeth Theater in Vancouver, Canada or an old dusty gymnasium in a little town in Kentucky.
" Later in the afternoon on Friday,while still playing his instruments in preparation for his show at the Crystal Palace,�he ordered a chicken fried steak dinner. Buck said he had eaten chicken fried steak all around the world and that "the Crystal Palace makes it the best in the world".
" It was an especially difficult challenge for Johnny, speaking at the podium with his Dad's open casket in front of him. We all just wanted to hug him.
" Trace Adkins was next to honor Buck. He�said that Buck told him, "Always throw in that low note. That's about all you've got going for�ya." The crowd laughed appreciatively with Trace.
" Then Trace sang with just his guitar, "WAYFARING STRANGER". He made appropriate use of his deep voice and that deep low note, just for Buck.
" Buddy Owens reminded us all of Buck. He resembles his Daddy the most of all Buck's children. Buddy told of Buck's encouragement in his musical career and the priceless education he received by following Buck's lead in business too.
" Dwight Yoakum was next to honor Buck. He came up on stage from the front pew carrying his hat and wearing his guitar. He apologized to his Mother who, he said,�would not have approved of singing with a musical instrument in church and ask the forgiveness of those in attendance for putting on his hat to sing, in honor of Buck. He told the story of the time Buck told him, "You look good in that hat, Dwight. You oughta keep in on more." " We all laughed along with Dwight, who then respectfully put on his classic Cowboy hat and sang a touching rendition of "IN THE GARDEN". More tears came our eyes.
" I must express my personal�admiration for all those who sang under such emotional stress. Singing the last songs to Slim Pickens at his funeral was the most difficult performance task of my life. The next most difficult time for me would have been coming on stage at the Crystal Palace, after Buck's funeral at the request of Buddy Alan, to perform with my longtime friends, The Buckaroos.
" Our pastor, Roger Spradlin, delivered the message of the hope and the promise that we all have through Jesus Christ. He also said that Buck, always seeking a deeper understanding of God's Word, �would often call him at home late at night and ask questions about something he had read in the Bible. Few knew that about Buck.
" Pastor Roger told the story of a day, some years ago, when he�was�at the bedside of Buck's mother, Maicie�in the hospital.��Buck arrived to visit with her. Maicie was a leader in the Christians Women's Group.
" Pastor said that Buck's Mother whispered in Buck's ear, but pastor could hear the conversation.
" Maicie whispered, "The church needs a van. "�Some of the elderly ladies had trouble getting to church because they were too old to drive and there was a fund raiser in progress to buy a van.
" Buck turned to Roger and asked, "How much would a van cost?" " Pastor Roger said, "We have been looking at a used one that has a lot of seats in it for twelve thousand dollars." " Maicie motioned for her son to come closer and whispered in Buck's ear again, "We don't want a used van." " The congregation laughed out loud at this.
" Pastor Roger said that Buck didn't comment, but stayed a long while to visit with is Mother.
" Pastor told us, "The next day, the church had a brand new van." " Lulu Roman, the Hee Haw's funny "big ole girl" shared her story of how Buck had taken her from a grungy nightclub in Texas and put her in front of the world on Television's most popular show. She is now an ordained minister, still full of fun and laughter with a new Gospel CD.
" Lulu closed the wonderful�service with a beautifully sung interpretation of "AMAZING GRACE".
" Then the family had provided security and limousines to drive us friends of Buck�to a private celebration of Buck's life at the Crystal Palace.
" The Buckaroos, Buddy Allan, Brad Paisley, Dwight Yoakum and I sang and spoke about Buck. Also Lulu Roman, and Susan Raye sang for us.
" Buck's farewell party offered all the great food and drink that the Crystal�Palace is famous for and of course�it was "All You Can Eat and�Free of Charge".
" There were lots of laughs and great music and lots of hugs and exchanging of current phone numbers, but the air of frivolity still had a strange feeling about it that I cannot find the words to describe or explain. Since I first got the news that Buck has gone, I am still feeling out of balance and mentally dull, as if I haven't finished sleeping, but I am lying here thinking of getting up and moving along with life...with not my usual enthusiasm.
" I'm sure many are still feeling like Mike Owens told me he felt, "It's like I'm dreaming, Mayf. I keep hoping any minute now I'll wake up and find out its not�really happening." " Lots of hugs were shared among longtime friends. There was lots of needed healing in those hugs. But no one gave a hug like Buck Owens.
" I love you, Buck. March 25, 2006. Early this morning I was contacted by my friend Sonny Langley informing me that our beloved Buck Owens had passed on in his sleep. True to form adhering to the old adage "That the show must go on" Buck performed at The Crystal Palace literally hours before his passing even though he wasn't feeling well. Buck always appreciated his audience and I was told some folks had came all the way from Oregon to see him so he felt compelled to carry on as long as he could. On a personal note I met Buck on three occassions and he was always polite and accomodating to me. He took the time to personally sign the above autograph as well as autograph a guitar for me. He had a huge presence in Bakersfield and was an avid promoter of The Bakersfield Sound. He had plans to convert his kitchen at The Crystal Palace to a room devoted to "The Bakersfield Sound" paying homage to many of the local musicians such as Bill Woods, Red Simpson, Billy Mize, Ferlin Husky, Fuzzy Owen, Jean Shepard, Tommy Collins and I'm sure many others. Buck We're Going To Miss You. A poem from our friend Howell House in Tennessee to pay tribute to Buck Owens. Ralph Mooney and Red Kilby performing onstage at the 2006 Texas steel guitar show held in March. As you know Ralph's pedal steel guitar playing is legendary and has performed and recorded with many many famous musicians including two of my favorites Wynn Stewart and Merle Haggard. Red Kilby is a singer/songwriter who hails from Colorado and has a stellar Traditional Country Cd which includes three cuts featuring Ralph's prowess on the pedal steel. Red was singing "The Bottle Let Me Down" with Moon when that picture was taken. We feature a clip of Red singing his song "That Bakersfield Sound" when you first log onto this website. His Cd is called "Keepin' It Real" available at www.redkilby.com. On 02/15/06 I attended a George Jones concert at the Performing Arts Center in San Luis Obispo, CA. The gentleman standing next to George Jones is my good friend DJ Lil Lyle who has a Traditional Country radio show on KJUG 98.1 San Luis Obispo on Sunday mornings from 6-10am. The picture was taken backstage and then Lil Lyle came out to announce George's performance. Lil Lyle is 6'7". By the way George and the band were in top form and put on a dazzling two hour show. Country outlaw Merle Haggard, who made his chart debut in December 1963 with "Sing a Sad Song," has the longest span of any artist on the Hot Country Songs survey. 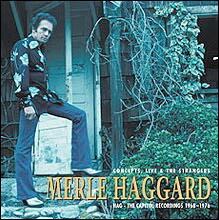 Two days after receiving a lifetime achievement Grammy, Haggard re-entered the chart Thursday, Feb. 9th at No. 50 as the featured guest on Gretchen Wilson's Grammy-nominated tune "Politically Uncorrect." Haggard also debuted on the latest chart as a songwriter. George Strait's version of Haggard's 1974 song "The Seashores of Old Mexico" was the top new entry at No. 48. Tommy Hays who is well known as one of Bakersfield's top vocalists and premier guitarists has released his first Cd titled "60 Years of Western Swing" featuring his band the Western Swingsters. Tommy who is recognized as one of the original Bakersfield Sound Pioneers has really delivered some fine traditional Country songs on this Cd. His Cd features fourteen cuts with Tommy singing three vocals and premiering his guitar virtuosity on several instrumentals. The rest of the vocals and instrumentation are covers of many fine Traditional Country songs shared by some of Bakersfield's finest Tracy Barns (saxophone & vocals), Jimmy Phillips (vocal & drums), Maria Weir Werth (vocals), Bill Wilkerson (vocals & bass), Hughie Smith (fiddle) and Larry Petree(pedal steel). The Cd is available for the amount of $12.00 which includes shipping & handling. Please remit to: Tommy Hays, 10008 Polo Trail Ave, Bakersfield, CA 93312. Also Tommy's band can be hired for music for all occasions by calling (661)589-3012. On February 8,2006 at 7:30 p.m. there will be a Cd release party featuring Tommy's Cd and also one of Bakersfield's original Pioneers ... Mr. Billy Mize. Billy's latest Cd is titled "Make It Rain." The event will be held at Buck Owens Crystal Palace and will include performances by Tommy Hays and The Western Swingsters with a guest performance by Billy Mize. 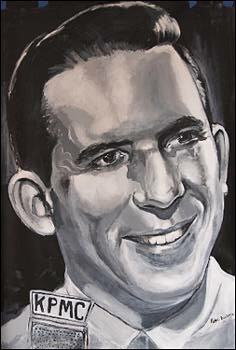 Saturday, November 5, 2005, at Buck's Crystal Palace in Bakersfield, California, the Rockabilly Hall of Fame� inducted Buck Owens and Mayf Nutter. 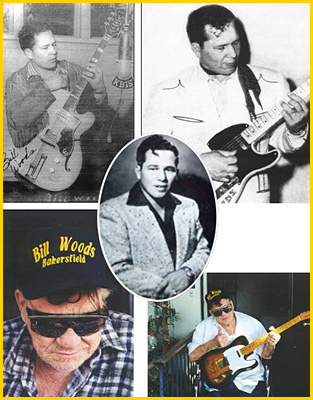 Buck's roots in rockabilly go back to the days when he played rhythm guitar on some of Gene Vincent's early recording sessions and recorded "Hot Dog" under name of Corky Jones. Mayf, besides his accomplishments in music, films and television, once fronted "The Kingsmen." This was the group of Billy Haley musicians who recorded "Wild Weekend", an instrumental under an alias name. The group became very popular in Pennsylvania, so Bill Haley gave Mayf one of his jackets and told him to lead the group when they performed. Here's our friend, and might add one helluva singer, Wendell Crowley (pictured right) [www.wendellcrowley.net] hanging' out with Jason Aldean [www.jasonaldean.com] who has a massive hit currently on the charts and video rotation on CMT called "Hickstown." The picture was taken at The Beachwagon Nightclub in Myrtle Beach, SC. 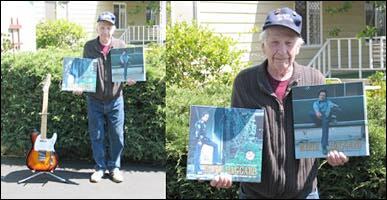 Glenn J. Pogatchnik and his neighbor Don Thomas from Oildale now living in Los Osos, CA holding a blowup picture of Merle's "Haggard Like Never Before" CD. Thanks to Joe Stormont who works for the Dewalt Corp for supersizing Merle's picture. Sonny Langley, Brett Neal and Red Simpson. Sonny Obrien & Sonny Langley ... two of the best singers residing in Bakersfield. 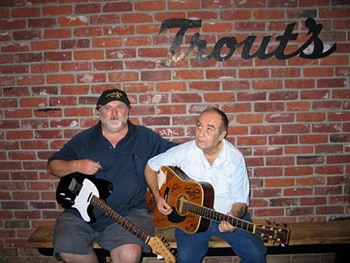 Glenn & Sonny jamming out in front of Trouts. Weekly regulars Herschel & Rosie with friend Rockwell. Diane - Don - Richard Thomas. Don is my neighbor in Los Osos, but is originally from Oildale where Trouts is located. Richard is his brother and Diane is Richard's wife. They had a ball at Trouts watching all the singers jam with the great Red Simpson. Here's Sonny trying out a new Martin guitar at Guitar Center in Bakersfield.. The Bakersfield Country Music Museum now has a 24hr. Hotline announcing all scheduled events including musical events inviting musicians/singers to their jam sessions at (661)366-6003. These events also include "get togethers" of all the original Bakersfield Sound Pioneers if their schedules permit.So this gives avids fans a chance to converse and listen to stories from those who were instrumental in creating The Bakersfield Sound. HEATHER MYLES performing at the Are Duved Country Music Festival in Sweden on July 15, 2005. Photos were sent to us by our ol' buddy Owe "The Viking" Roslund from Trangsviken, Sweden. Yes, that's Owe pictured with Heather. Heather's Hot Line Fan Page. By Glenn J. Pogatchnik - Recently on a Sunday afternoon at the Sequoia Room in the Best Western Inn next to Buck Owens Crystal Palace I attended the BCMM 5th Annual Pioneer Reunion. First of all I would like to acknowledge the efforts of a young lady by the name of Inez Savage who assembles these events. It's a lot of work but I'm sure a labor of love for her. Also a legendary guitarist/singer Tommy Hays whose house band Tommy Hays & The Western Swingers provided the music for the performers. Here are a list of some of our revered entertainers that were present that day who were and are a who's who of the early Bakersfield Sound many of whom are dear friends of Buck Owens and Merle Haggard. Others came along later and some are still performing in and around Bakersfield to this day: Red Simpson, Billy Mize, Johnny Barnett, Johnny "Texas Drummer Boy" Cuviello, Tommy Hays, Inez Savage, Cliff Crofford, Sonny Obrien, Sonny Anglin, Sonny Langley, Hank Decato, Lawton Chiles, Huey Smith, Jimmy Phillips (legendary drummer on many of the Bakersfield Sound's earlier recordings) Jerry Hobbs, Bill Wilkerson, Tracy Barnes and Sandy Holly (sister of Doyle Holly). Although I didn't get to meet him ... I was told Tommy Collins' son was also in attendance. Here are some of the pictures that were taken that day. This is a personal account of Loran's life experiences growing up in a small agricultural town called Shafter just a short distance North of Bakersfield. 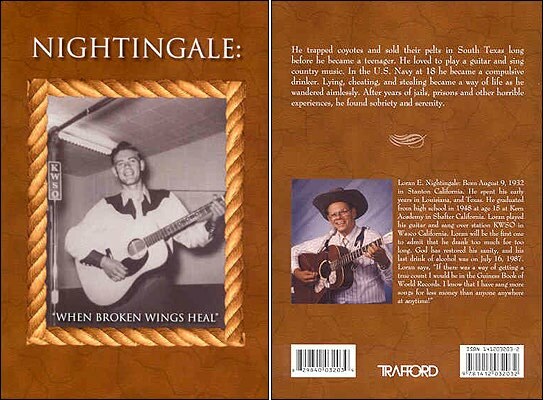 His story portrays what it was like to live in the golden era of The Bakersfield Sound. Loran frequented many of the Taverns and Clubs such as the Blackboard, Tex's Barrel House, The Clover Club, High Pockets, The Lucky Spot etc. that spawned such careers as Merle Haggard, Buck Owens, Jean Shepard, Ferlin Husky, Billy Mize, Wynn Stewart, Bonnie Owens, Cousin Herb Henson, Bill Woods, Tommy Collins, Dallas Frazier, Gene Moles, Roy Nichols, Jimmy Thomason, Lewis Talley, Fuzzy Owen, Al and Tom Brumley, Joe and Rose Lee Maphis, Maddox Bros. & Rose etc. His story doesn't stop there. He shares his experiences of travelling all over the United States during the 50's and 60's and even his time living close by his friend Merle Haggard living in Northern, Ca. Loran is also a wonderful singer/songwriter amongst his other accomplishments. I personally haven't enjoyed reading a book as much as this one as when I was a child reading the Adventures of Tom Sawyer and Huckleberry Finn. I would call this book "The Adventures of Loran Nightingale." The Ambassador holding his Fender Telecaster "Trigger" signed by Buck Owens, Alan Jackson and his friend Merle Haggard ... at the broadcasting booth of radio station KKJG San Luis Obispo, Ca where his dee jay friend Lil' Lyle broadcasts his "Country Standard Time" show which features Traditional Country Music every Sunday morning from 6-10am. (LEFT) Here's the Ambassador relaxing at home holding two Fender guitars that Alan Jackson signed at a concert at the Savemart Center in Fresno, Ca held on August 12th, 2004. Tom Rutledge a member of Alan Jackson's band the Strayhorns helped Glenn (The Ambassador of the Bakersfield Sound) Pogatchnik in the process of getting the guitars to Alan to sign before the concert. Tom also provided Glenn and his Mother Mary Lou two tickets up in the front rows to watch Alan and the band perform. 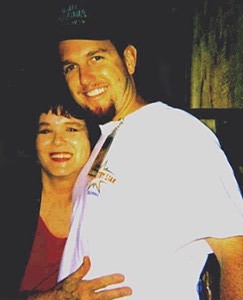 RIGHT: Tom Rutledge and Glenn's mother after the concert. NASHVILLE, August 9, 2004 - The Stage, a club located in the middle of Nashville's honky tonk Lower Broadway scene, played host to a special birthday party Sunday, August 8th. The house band was a six piece group, The Buck Owens Tribute Band, that featured many of Buck's hit songs. Also on hand was long-time Buckeroo Doyle Holly, Hee Haw's famous Hager Twins, Ira Allen along with Russ Varnell, Will Clements, Mike Preston and Eugene Moles (Gene's son) pickin' lead for the house band. Buck called in from Bakersfield and spoke to the crowd as Tribute Band leader Jeff Sallee's cell phone was held up to the mic. The audience then sang "Happy Birthday" to Buck. Great music, great audience, great time. WSM-AM was on hand to assist with the event. As of March 21, 2004 the Rockabilly Hall Of Fame celebrates seven years of existence. Bob Timmers, my friend, is the owner/curator not only of the Rockabilly Hall of Fame but the Traditional Country Hall of Fame (www.countryhall.com). He also is our "That Bakersfield Sound" website designer. A service he has never charged us a single penny. If any of you out there have had any website design you know how costly it can be. 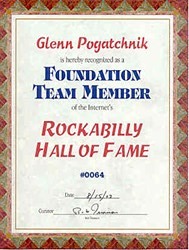 Well as you can see I am a Foundation Member of the Rockabilly Hall of Fame and you too can be for only ten dollars a month. This is an extremely important because Bob Timmers relies completely on donations and membership drives to operate his various websites. 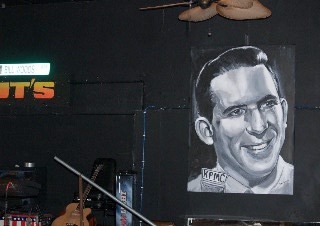 If you log onto www.rockabillyhall.com. You can view the process of helping to financially support the Rockabilly Hall of Fame. On a personal note I want to tell you a little about Bob. I have had the privilege to have known him for over six years and consider him to be one of my best friends. He is a man of impeccable integrity and his word is gold. He is very well respected in the Nashville community (as well as Europe, Canada and Australia) where his operations are located in a nearby town called Burns, TN and works tirelessly many days putting in eighteen hour days bombarded with numerous requests made of him. He has singlehandedly reignited many stars careers thru his efforts. He knows many famous people but you'll never hear him bragging about who he knows many of whom call him up and ask him for advice and a helping hand. He also is an accomplished guitar player and is coveted as a studio session man when the job needs to be completed in a professional manner. This man is so dedicated and passionate about what he does he took the time, with the financial help of a friend, to fly out to visit me in Bakersfield to "get the feel of what created the Bakersfield Sound." I showed him all the clubs and sights of Bakersfield and he even caught Buck Owens perform at Buck's Crystal Palace. Above all Bob is very humble and I know this praise embarrases him but his contributions to the music world need to be praised and most importantly supported with your generous donations. So if you enjoy this wonderful "That Bakersfield Sound" site please support the man who has literally donated hundreds of hours to make this site available for all of us to enjoy. He is a National Treasure. (Posted June 5, 2003) By Jon Johnson. Of the great country bands of the 1960's, none was more successful than Buck Owens and the Buckaroos. Holly still clearly misses Rich as well. "Don was just a great big old teddy bear who'd set the world for you," says Holly. "I remember an incident where somebody called up Don about two or three o'clock in the morning and said, 'My battery's dead. You've got to give me a jump.' And (this person) figured Don knew who he was talking to. So he said, 'Yeah, I'll be there in a minute. Tell me where you're at.' He gave him the directions where he was at, and Don got up to get ready and said, 'By the way, who is this?'" "Carnegie Hall Concert," in some respects, represented the high water mark for Buck Owens and the Buckaroos. Owens and his crew were only the second country band to record a live album there (following Flatt & Scruggs' lead in 1962), and the album captures a flawless performance from the group. Today Holly appears to have a good life. He sold off the music store not too long ago and now regards himself as "semi-retired," playing a handful of live dates per year (in fact, he had just returned from opening two shows in Canada for Steve Earle the day before this interview was conducted). And Holly takes some pride in the fact that the records he played on have had such a lasting influence on later performers including The Eagles, the Desert Rose Band and The Derailers. "You bet. We weren't really country, although we thought we were. I would [say] that we were a bunch of bluegrass musicians with electric guitars. Don was so versatile. He dug the Beatles. He dug The Band...in fact we recorded three or four songs by The Band."